Bare windows are no fun, so often we try to get something generic or maybe in a color that we like without any consideration for functionality, style of the home, our OWN personal style, textures, and so on. Sometimes making a quick decision on window coverings can even lower your curb appeal. Obviously, doing nothing at all is the first mistake. Whether you’re overwhelmed with choices or just don’t know where to start, bare windows are no good. Not only do you lose privacy within your home and a lot of benefits of temperature control (and money saving elements), rooms with bare windows feel, well, bare. They’re a large focal point of rooms and an undressed window is like putting up an empty picture frame. Along with a fresh coat of paint, new window treatments are the easiest way to change the entire look and feel of any room. The right window coverings can even function as their own bit of art. 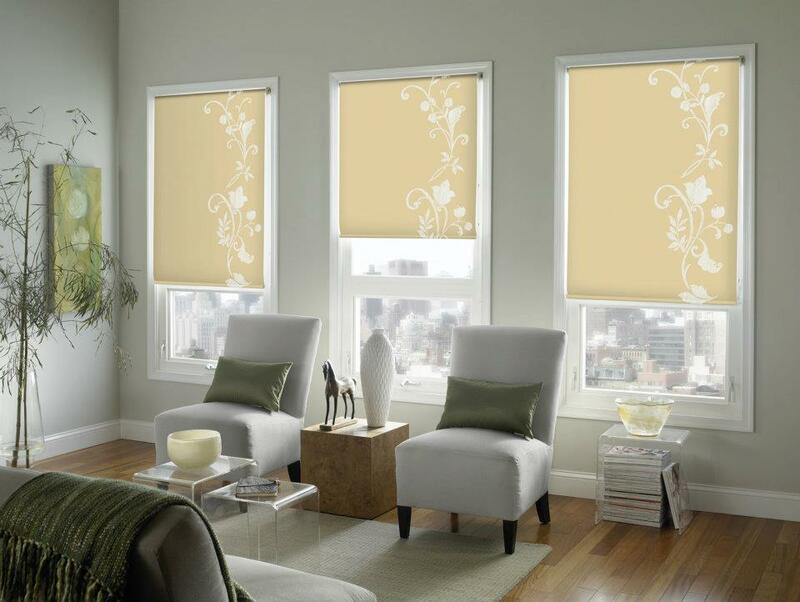 A light yellow roller shade with a delicate floral pattern becomes a softening design aspect of what otherwise would be a rather stark room. 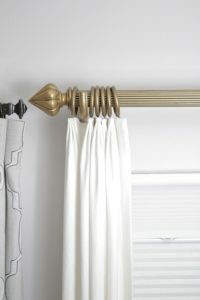 There are a million choices in styles for curtain rods, finials, hooks and more, but not all of them are going to be the right choice for your home. 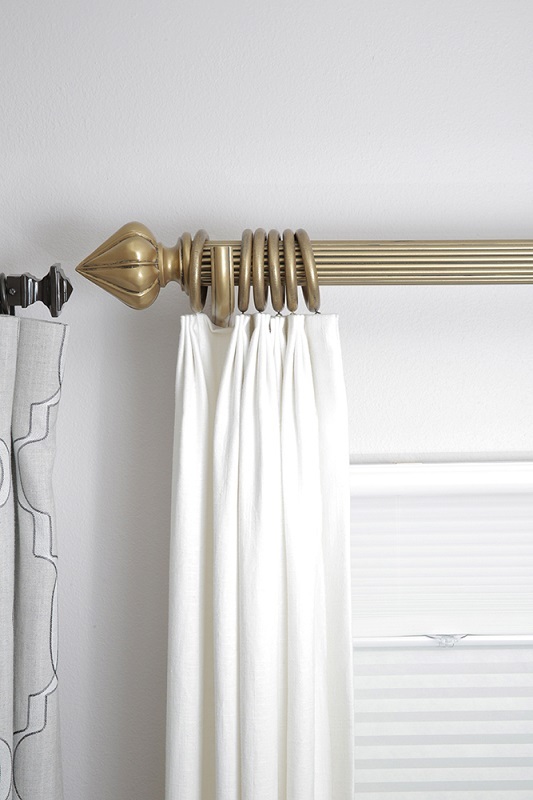 If you have brushed chrome lighting in a room, a bronze curtain rod will look out of place. If your home’s style is traditional and you put up very modern and sleek rods, they could end up looking boring and oddly plain instead. Last but not least, the wrong hardware may simply be inappropriate for the window covering you’re putting up and if not able to bear the weight – or installed poorly – could actually end up damaging your walls. When choosing hardware, make sure first that it can support the weight of the window coverings you put on it, and be mounted correctly. Then ensure that you keep the entire room (and even entire home’s) style as part of the design decision. At our showroom in Chatsworth, you can come see, feel, touch, and even test combinations of rods, finials and draperies to get a good idea of what would work best in your own space. Different rod and finial styles, finishes and designs could make or break your finished look. You may find a fabric you love for a throw pillow and think it makes the perfect drapery as well. It may, but window and room needs a little more thought than just that. Do these curtains need to be sheer to allow more light, or should they be backed with heavy fabric to provide light-blocking abilities to improve sleep? Is this room one where you want a lot of privacy, or one where you want to make sure the beautiful view isn’t blocked? These considerations play across each room. You can most likely still use that fabric, but changing its use for every window’s unique needs will ensure you keep loving it for years to come. Our design team is incredibly experienced at making sure each room’s design and functionality blend together seamlessly. And yes, we can use your beloved fabric to make custom treatments (and pillows) for you! 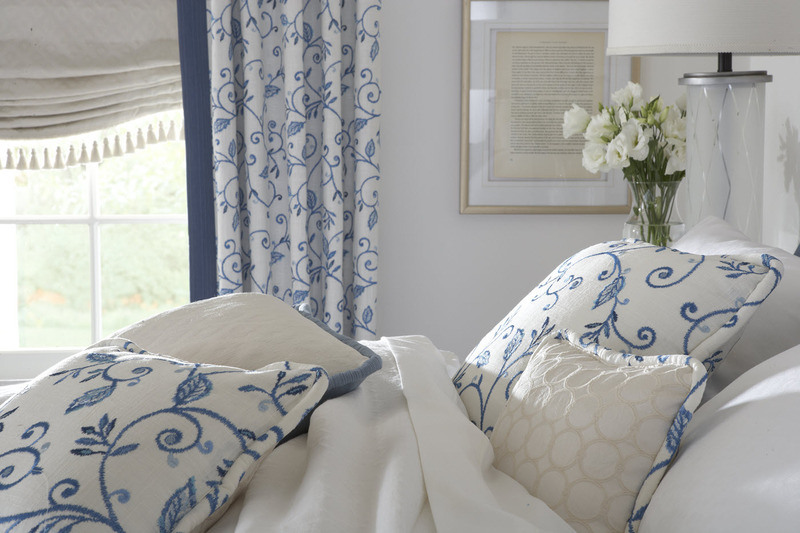 Your fabric fabric may be able to work within a room’s needs with some creativity and planning. For more in-depth information to help you think like an Interior Designer when Selecting your Window Coverings, download our free guide! Improperly fitted window coverings are probably one of the most common mistakes. When you open your curtains or draperies all the way, you want them to be able to fold up nicely on the sides of your window – that’s right, the sides. You don’t want the window itself to still be covered when these are open, but you also don’t want bare wall showing, and you also don’t want them to be pulled super tight and flat when they’re closed either. When it comes to length, nearly touching the floor looks amazing, and is usually a good goal to aim for. Gathering draperies in pools on the floor really should only be reserved for bedrooms where pets never go, and to create a dramatic, romantic look. Most people are afraid to put the supporting hardware high above the window as well, but that’s what you want to do. Go as high as you can, with maybe an inch between the top of your hardware and your ceiling or crown molding. This makes the windows look larger and beautiful. With blinds or shades, too long looks sloppy as they’ll wad up or hang down awkwardly, and too narrow means you end up with gaps on either side. There ARE both inside and outside-frame mounted options, so knowing the difference and measuring accordingly will help you get the best fit. You’ll want at least 1-½” extra on the outsides if you’re not fitting tightly within the frame. These drapery panels barely skirt the floor without touching it, making the window itself look large, but also neat. We talked a lot about material choices in our blog about choosing the right window treatments for pets, but this applies to children and even your own lifestyle as well. Some window coverings are potentially deadly to your pets or children. Aside from safety, hard-to-clean treatments don’t belong in a mudroom or kitchen, for example. If your window coverings will be in a very humid area, such as a bathroom or laundry room, the wrong selection of wood in a shutter could end up warping or bowing over time. 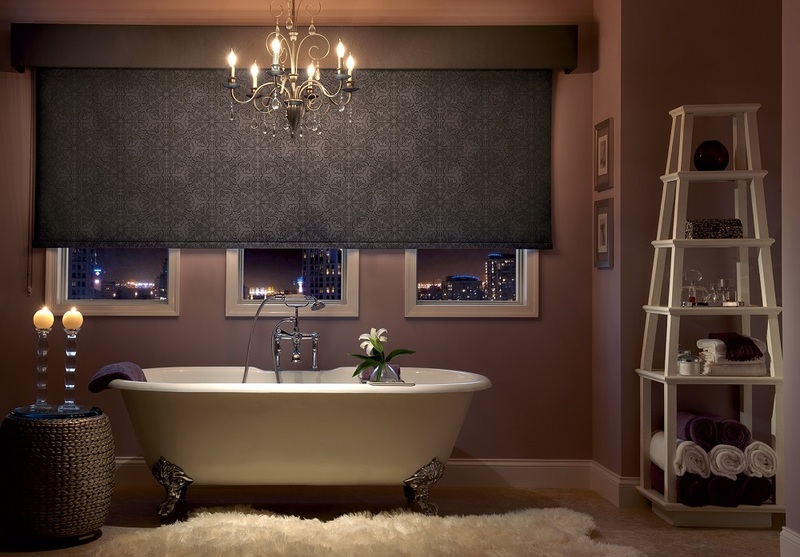 These roller shades can handle constant humidity or even being slightly splashed, making them a perfect fit in this beautiful master bathroom. Wooden shades here, if not treated properly, could be ruined quickly. Some Home Owner’s Associations require that everything facing the street is white. In a previous blog we showed off a beautiful mansion project by our designer Debbie, where all white shades and shutters were utilized for a beautiful end result that did match on the front of the home. While we don’t want you to feel limited to white-only, we support the idea that you should take the exterior view into consideration. 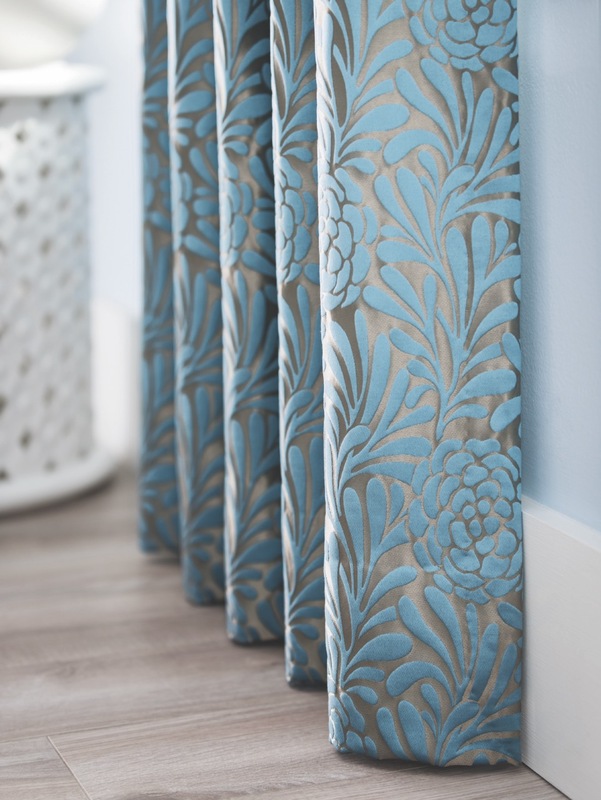 Sometimes matching blinds, shades, draperies or curtains throughout the entire home fits your style perfectly. If so, great! Then it’s a matter of choosing the right color, texture and style that fits your home’s cohesive design. If you have different members of your family wanting different styles in their spaces, or you just want some variety, cohesiveness from the outside is still possible. If you’re going the drapery route, this could mean all white backings or white linings with the varying designs only visible from the inside of the home. You could even have all white shades or shutters and allow the interior draperies to serve mainly as design features. 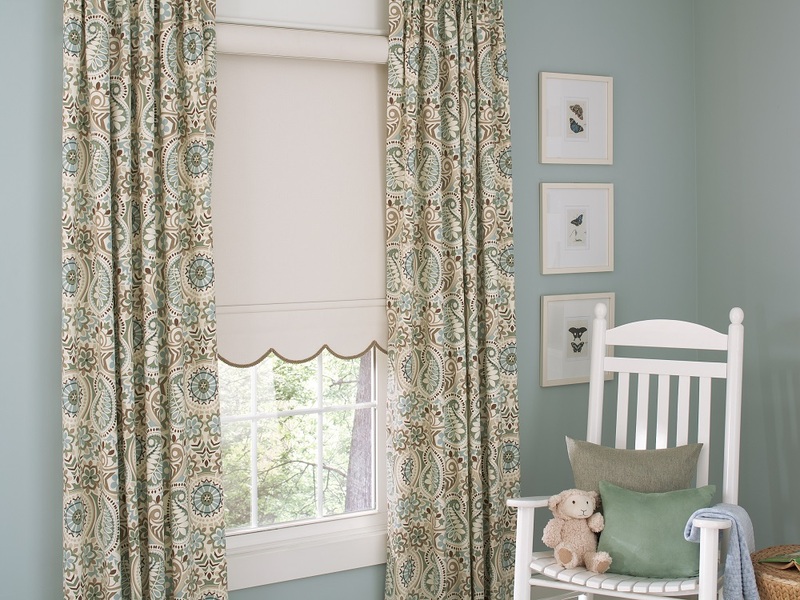 The white shades on this window from the outside will look cohesive and clean, but the layering of curtains inside allow for a floral and adorable touch to this nursery. These are just 6 of the most common mistakes we see, and often what we’re called in to remedy! Browse our blog for even more design tips, or give us a call and visit our showroom for more expert help. Hiring our designers will allow you to create the custom look YOU want hand-in-hand with someone who knows all these rules and will help you avoid common mistakes.